Ultra pasteurized, grade A. Produced without antibiotics, added growth hormones (FDA States: No significant difference between milk from cows treated or not treated with artificial growth hormones), or pesticides. USDA organic. Sunny, green pastures. Healthy cows. 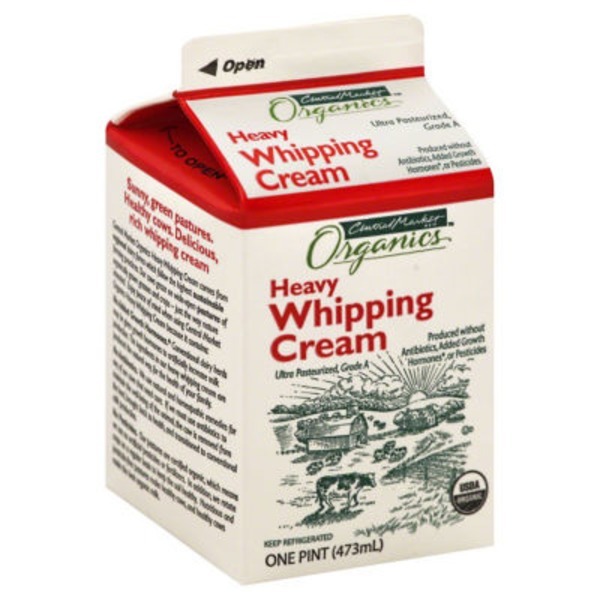 Delicious, rich whipping cream. Central Market Organics Heavy Whipping Cream comes from regional dairy farms which follow the highest sustainable farming practices. Our cows graze on wide-open pastures of organically grown grasses and crops - just the way nature intended. Enjoy peace of mind when using Central Market Organics Heavy Whipping Cream because it contains: No Added Growth Hormones (FDA States: No significant difference between milk from cows treated or not treated with artificial growth hormones): Conventional dairy herds may be given growth hormones to artificially increase milk production. The ingredients in our heavy whipping cream are produced the natural way, for the health of your family. No Antibiotics: We use homeopathic remedies for any of our cows that need care. If we must use antibiotics to maintain the well-being of the animal, the cow is removed from the herd, brought back to health, and transitioned to conventional milk production. No Pesticides: Our pastures are certified organic, which means we use no artificial pesticides or fertilizers. In addition, we rotate crops on a regular basis to keep the soil healthy. Nutritious and pesticide-free pastures make healthy cows, and healthy cows make the best organic milk. Certified organic by Quality Assurance International. Product of USA.